Anne Blythe has a great life: a good job, good friends and a potential book deal for her first novel. When it comes to finding someone to share it with, however, she just can’t seem to get it right. After yet another relationship ends, Anne comes across a business card for what she thinks is a dating service, and she pockets it just in case. When her best friend, Sarah, announces she’s engaged, Anne can’t help feeling envious. On an impulse, she decides to give the service a try because maybe she could use a little assistance in finding the right man. But Anne soon discovers the company isn’t a dating service; it’s an exclusive, and pricey, arranged marriage service. She initially rejects the idea, but the more she thinks about it – and the company’s success rate – the more it appeals to her. After all, arranged marriages are the norm for millions of women around the world, so why wouldn’t it work for her? A few months later, Anne is travelling to a Mexican resort where in one short weekend she will meet and marry Jack. And against all odds, it seems to be working out – until Anne learns that Jack and the company that arranged their marriage are not what they seem at all. 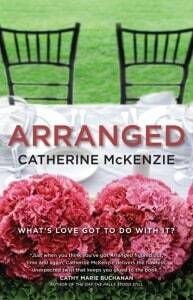 I became a fan of Catherine McKenzie after reading her debut novel, Spin and was excited to dive into her newest book, Arranged. The book follows the main character, Anne Blythe, as she leaves another failed relationship and feels down in the dumps because she is alone. All her friends are either married or are getting married and she is concerned that she won’t ever met the right guy. As she is walking on the street feeling self-pity, she finds a business card for something called Blythe & Company which she discovers is an Arranged Marriage service! She ends up giving them a call and making an appointment and that’s when all the fun begins! Anne does all the testing required by Blythe & Company and pays a hefty fee for their services. When they find a match for her, she goes to Mexico to meet her new husband and tie the knot. She clicks with Jack and things seem to be going really good for her and she is happy. Of course, the story does end there and the author threw a twist into the story when Anne discovers a big secret about her new husband and Blythe & Company. It’s a big shocker so I don’t want to ruin it for you and I was completely hooked and had to find out what was going to happen. I really liked Anne as a character and thought it was neat how her mother named her after Anne of the Anne of Green Gables books by Lucy Maud Montgomery (These are Canadian books based on a spunky young girl named Anne who lives with her aunt and uncle in PEI). I enjoyed all the references to Anne of Green Gables and how the character from Arranged even physically resembled Anne with her trademark red hair. The book made me laugh especially when Anne was down in Mexico going to meet her husband and she met some of the other clients of Blythe & Company. Margaret was a real nut and her choice of clothes put a smile on my face! I wasn’t too crazy for Jack, Anne’s match and new husband. I am not even sure if I can pinpoint exactly why I didn’t like him either. Maybe it was his personality or I sensed that he wasn’t being entirely honest with Anne? In any case, I didn’t like him and wasn’t really feeling the “connection” between him and Anne. However, it could be that the whole arranged marriage idea is completely foreign to me and I just don’t really understand how a person could marry someone they never even met. My favourite parts were learning about Blythe & Company and how the matchmaking works. I found it fascinating that they could do all these detailed tests and find the perfect match for their clients. The best part was at the end when Anne makes her last trip to Blythe & Company with a few choice words. I was rooting for her all the way. I definitely recommend you give this book a read. It was both fun and entertaining and worth picking up! I think I need to read this book. Arranged marriages continue to fascinate me. Great review and thanks for the heads up on the hubby. Are you gals on Goodreads? Is it like a social network site? It’s good for networking, tracking upcoming books, keeping track of books you want to read, entering book giveaways, swapping books, etc.